Like a lot of jazz lovers, I first was turned on to the bop stuff recorded by Charlie Parker and Dizzy Gillespie. That said, it took awhile for other instrumentalists to get on board with bop style and phrasing. I remember how excited it was, hearing guitarist Joshua Breakstone for the first time; he has been one of my favorites ever since. This release presents him in his favorite format, with a quartet. But this quartet is different: The usual guitar, bass and drums are joined by a cello, rather than a piano. Breakstone has long admired the piano, and its artists. He believes in a “kinship” between guitar and piano, and the artists who play them. This release features charts that some of the world’s great pianists have written and performed during their careers: thus the album title (88). 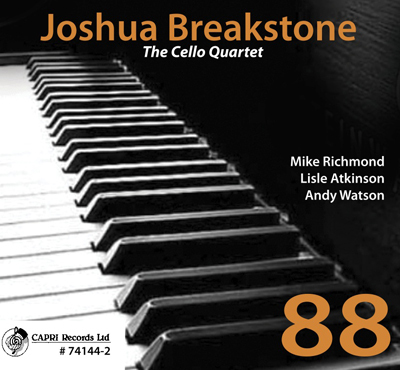 Breakstone is joined by bassist Lisle Atkinson, drummer Andy Watson, and cellist Mike Richmond. All are masters of their instruments, but I bet you’ve never heard a cello played the way Richmond plays it. The liner notes discuss each of the tunes, and identify the musicians with whom they’re associated; they include John Coltrane, Harold Mabern, Sonny Clark, Cedar Walton, Mal Waldron, Thelonious Monk, Barry Harris, Tadd Dameron and Lennie Tristano. At times, the interplay between the members of this quartet is almost unbelievable. Breakstone usually established the melodic theme, and then the others join in on variations and solos. If you aren’t convinced that each artist can produce great lines on his “horn,” this album will make you a believer. And that Watson, who not only establishes a solid rhythmic line; his breaks and solos add greatly to the overall presentation. This fantastic group swings like crazy, and creates truly great jazz. Please: More, more and more!